The Cretaceous Period, which lasted for some 80 million years (144.2 to 65.0 mya), saw a number of important geological changes, including the opening of the Atlantic Ocean which commenced in the Jurassic, and the closing of the Tethys Ocean in the course of the Alpine orogeny. The global climate was warmer than today and the earth had no significant ice caps. Thus oceanic circulation triggered by cold water formation in the polar regions was largely lacking. The absence of ice caps was accompanied by high sea levels (100 to 200 meters higher than today) and by extended, shallow, epicontinental seas. The Cretaceous Period ended with a mass extinction at the Cretaceous/Tertiary boundary when about one half of all animal families died out. This mass extinction is now thought to be related to the impact of a comet, east of Yucatan, Mexico. Some links to interesting web sites on the Cretaceous are provided at the bottom of this page. The Campanian Age, during which much of the fossil-rich marine marl beds of Misburg and Höver were deposited, lasted from 83.5 to 71.3 mya. In northern Germany, the depositional basin was modified on a regional scale by continued diapirism of the massive Zechstein salts (Upper Permian). Between the emerging diapirs a number of subbasins, including the "Lehrter Westmulde" east of Hannover, formed. Unconformities in the Upper Cretaceous sedimentary sequence attest to a changeable morphology due to salt migration in the underground. Faunistic studies (e.g. Christensen, 1997) have demonstrated that the shallow (50 to 100 m) Campanian seas in the Hannover region were connected to the northern (boreal) ocean, but had little exchange with the tropical Tethys in the south. Together, these quarries expose a combined thickness of nearly 300 meters, beginning with the early Lower Campanian Emscher marlstones and running well into the Upper Campanian. Most of this eastward dipping sequence comprises alternating limestone and marl beds, with CaCO3 contents ranging from 65 to 90 percent. (formerly known as "Quadraten-Kreide" and "Mucronaten-Kreide", named after the belemnites Gonioteuthis quadrata and Belemnitella mucronata) are the stratum typicum. Distinguished researchers, notably Schrammen, Roemer and Zittel, have collected much of their study material in the Misburg area. In general, the preservation of fossil biota in the finegrained Campanian sediments is fairly good. The fossils embedded in the marl and limestone beds have suffered from diagenesis to varying degrees. Echinoid coronas, bivalve shells, brachiopoda tests, corals, crinoid fragments and belemnites are preserved as unaltered calcitic substance while the aragonitic tests of gastropodes, nautiloids and ammonites were lost. Shark teeth are also preserved well. Siliceous sponge skeletons are mostly preserved in their original translucent, opaline substance. Sometimes the opal has altered into chalcedony. In such cases the spicules are clear and colorless and may show a roughened surface. Often, spicules are replaced by pyrite and/or marcasite, particularly in the basal regions of sponges. When fresh, pyritized spicules tend to preserve all the original details of the skeletal elements. 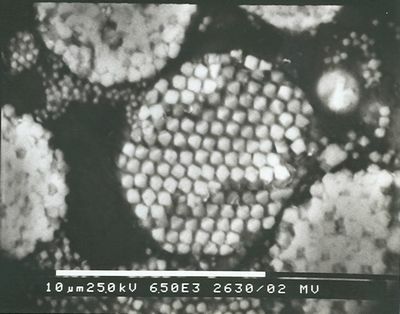 However, the iron sulfides, particularly marcasite, make the fossil sponges prone to oxidation and decay. Pyritization of fossils is more widespread in the Lower Campanian, but is also present in the Upper Campanian. Pyrite commonly originated as framboidal pyrite (from sulfur bacteria), but diagenetic recrystallization also produced well developed, sometimes large crystals of pyrite and marcasite. From a chemical point of view, the replacement of opaline spicules by pyrite is not readily understood. The author assumes that bacterial sulfate reduction shifted the pore water pH locally into the more alkaline region, thus facilitating dissolution of spicule silica. 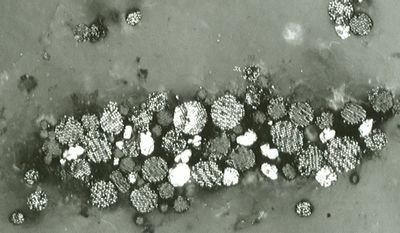 The spicule voids were then filled by bacterially precipitated iron sulfides, with di-valent iron provided by diagenetic pore fluids. The preservation of sponges is also impaired by a second phenomenon. When found in-situ, those parts of sponges which were embedded into the bottom sediment are generally well preserved while their upper parts are more or less destroyed. In many cases, the sediment embedding the preserved part of the fossil is more calcareous, but is overlain by more clay-rich layers where the fossil is destroyed. This observation could be explained by the erosive action of episodic turbidity currents. The fact that more fragile sponge species like Coeloptychium and other hexactinellid sponges are often found dismembered supports this interpretation. Finally, sediment compaction has also led to deformations in fossils. While brittle fossils like echinoid coronas tend to be crushed, most sponges were deformed in a coherent manner, i.e. without breaking apart. Cylindrical sponges have attained oval cross sections which indicate compaction of up 50 percent of the original thickness. However, average compaction is less, particularly in the more rigid limestone beds. Framboidal pyrite as part of a pyritized sponge. Höver. Reflected light photomicrograph; oil immersion. Pyrite framboid (ordered type). Höver. SEM-photomicrograph. 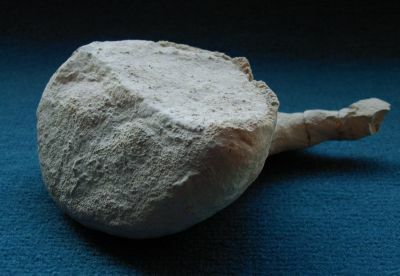 Example of an eroded sponge. www.palaeos.com: A brief description of the Late Cretaceous (Santonian). www.cretaceousfossils.com: A site dedicated to Cretaceous fossils.